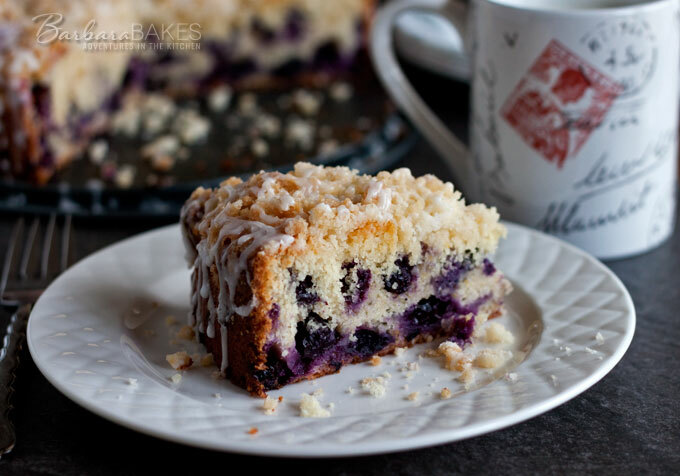 Tender, moist lemon coffee cake loaded with blueberries crowned with a crunchy, sweet crumb topping and drizzled with a tart lemon glaze. A fun way to change up blueberry muffins. I was microwaving a bowl of Trader Joe’s Instant Multigrain Triple Berry Instant Hot Cereal for breakfast last week, and my son came upstairs and asked if I was making blueberry muffins. My family loves my streusel blueberry muffins and apparently just the smell of blueberries cooking draws them into the kitchen in hopes of finding blueberry muffins. So when the weekend rolled around, I decided I’d better make some blueberry muffins for my son. But I also wanted to make something new to share on the blog, so my lemon blueberry coffee cake was born. I used my blueberry muffin recipe as the base for the cake, but change it up by adding lemon zest to the batter. Coffee cake is always better with a crumb topping, and to give it another pop of lemon, I drizzled a tart lemon glaze on top and let it flow down the sides. You can drizzle the glaze on with a spoon, but I like to use a quart size Ziploc bag. Put the bag in a tall drinking glass or mug, fold the edges over the top of the mug, then fill the bag with your glaze. Seal up the bag and snip off a tiny bit of the corner of the baggie with scissors. Then just drizzle the glaze over the top of the coffee cake. If you want to get drips down the side of the cake, just put a little puddle of glaze along the edge and it will make a pretty little drip down the side of the cake. You’ll know your glaze is too thin if the glaze just runs down the side. If it’s too thick, it won’t drip down. You can do a test drip before you put the glaze in the baggie if you’re unsure if you’ve got the consistency just right. 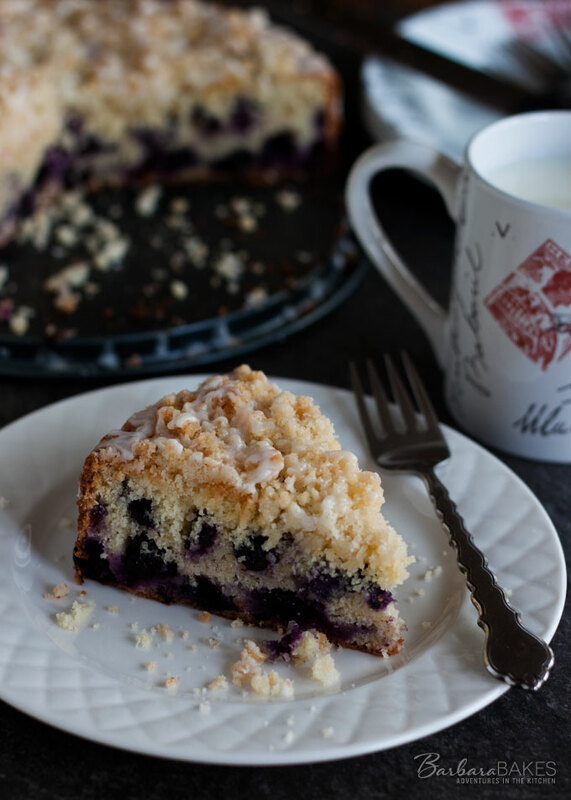 If your family loves blueberry muffins as much as my family does, they’ll love this coffee cake too. It takes blueberries to a whole new level. Update: I’ve added a new video that shows just how easy this coffee cake is to make. 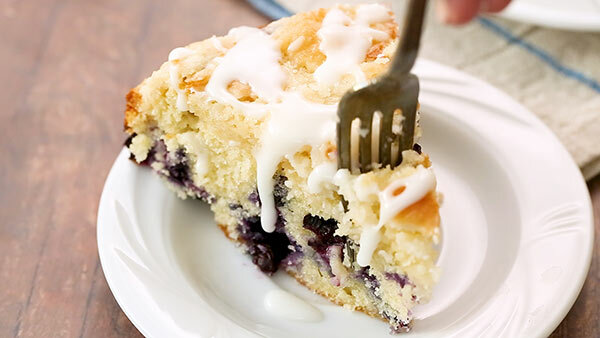 It’s become one of the most popular recipes on Barbara Bakes. If you haven’t tried it yet, you definitely need to try it soon! My topping is more crumbly than when Holly made it for the video, but you get the idea. In a large bowl, beat butter and sugar until light and fluffy. Add eggs, vanilla and milk. Mix in lemon zest. Add flour mixture and mix just until combine. Stir in blueberries. Bake at 350º for 45 minutes or until a toothpick inserted into the center comes out clean. 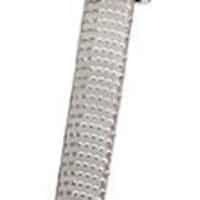 About 210 degrees with an instant read thermometer. In a small bowl, combine sugar, flour, and butter. Mix until mixture is crumbly. I love this coffee cake and make it often! Delicious! That’s great – thanks Liz! Can you use frozen blueberries for this? Hi Heide – yes, you can use frozen blueberries. Don’t thaw them; you’ll probably need to increase your cooking time. You want the center of the cake to be about 210 degrees. Enjoy! Do you think I could use sour cream instead of milk? I have so much sour cream in my fridge to get rid of! And would you adjust the amount of baking powder or add some baking soda if using sour cream? Hi Brandi – I think you’ll need more liquid than just sour cream would provide. Maybe thin it out with a few tablespoons water. The crumb topping seems different. 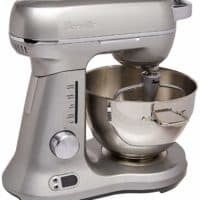 Should the butter be melted or should the butter be blended with other ingredients with a pastry blender? Hi Lori – yes, the butter should be melted. It says melted butter in the ingredient list. Although cutting it in with a pastry blender works as well. Great recipe! Made four cakes from it. Only adjustment made was I substituted the fresh eggs with pastuerized eggs. Thanks Ariel! Glad it was a hit. Great – thanks Julie! What brand of GF flour did you use? Do you think I could do this in a bundt pan, if I put the topping on the bottom? Minus the icing? Do you think the topping would crisp? Hi Shari – you have to put the topping on the top of the bundt and serve it upside down. It won’t crisp if you put the topping inside the pan. It will look a little unusual, but you’ll still love it. I’ve been a fan of blueberries since childhood and my children, fortunately, inherit that love from me! Trying this one certainly! What other pan can you use if don’t have the 9inch springform pan. 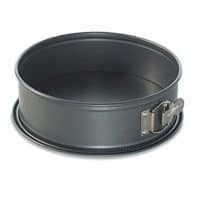 Hi Pat – you can use a regular 9 inch cake pan, it’s just harder to serve. Ok, ultimately my fault for not reading the instructions all the way through, but the icing ingredients are listed under the crumb ingredients, which I mixed all together like it said in the beginning of the recipe. I guess don’t mix the lemon juice and powdered sugar in with the melted butter, sugar and flower like I did. Hi Michelle – I created a new section for the icing in the ingredients list to make it clearer. Thanks for the feedback. All I have is skim milk. Will that work? I haven’t made it with skim, but make it with 1% all the time. So skim should work as well. 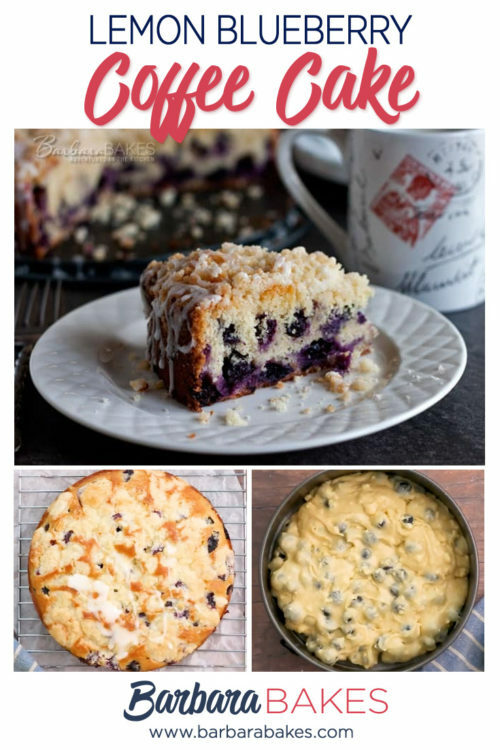 I tried this Lemon Blueberry Coffee Cake. It turned out great. Everyone loved it. I used skim milk with some half and half instead, because that’s all I had on hand. My coffee cake also didn’t raise as high as in the picture. We all loved the slight touch of lemon. I was in a hurry and forgot to put on the crunch topping. I realized after it was baked. Since the coffee cake was still warm, I put the topping on and put it in the toaster oven, making sure not to burn the topping. Sounds crazy, but it worked. I let the cake cool and put on the glaze. It still turned out wonderful. How I forgot the topping? Don’t know. It’s best to go over everything, (recipe, ingredients) BEFORE putting into the oven. I learned my lesson. Glad it was a hit – thanks Linda! I don’t have blueberries can I use raspberries instead? Or will it be to bitter? I haven’t tried it with raspberries, but it should work. Let me know how it goes. You can’t beat lemon and blueberries-a match made in heaven. I could go for a slice of that right now. 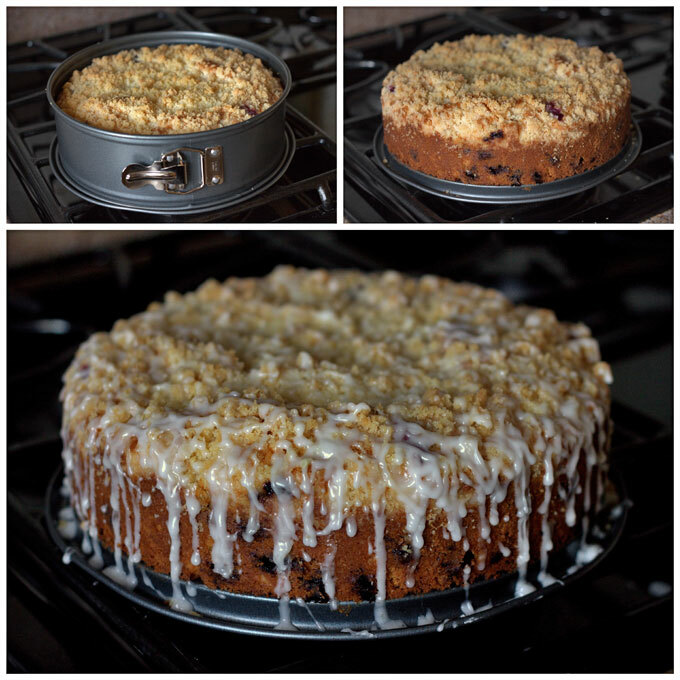 I love a good crumble on coffee cake and muffins…that looks amazing.